Well, October came and went in what feels like the blink of an eye. It was a busy month and I only managed one blog post. I’m sure you all know how much I love this time of year and now that it’s November, my sights are set on Christmas! The end of summer and beginning of fall were busy with the beginning of wedding planning. I've decided to hold off on any further wedding planning/prep until the New Year. We managed to get everything necessary booked and deposits paid so now we can relax and I can work on my DIY decor starting in January. We had our engagement photos taken this past weekend which was so fun and we are so thrilled with what was captured!! We wanted more lifestyle/candid shots including some at home with our favourite girl, Poppy. Our photographer Jenn Eggleston did an amazing job capturing just that! We live in the cutest village so we took advantage of the downtown shops, the woods and the beach for the perfect cozy fall/winter scene. This weekend our friends are throwing us an engagement party which we are excited for and after that, Christmas will be in full swing with family gatherings and parties every weekend until January. And I love it all!! I usually hold off on decorating until the end of November so next week I will start pulling out my decorate but our tree doesn’t go up until after December 1st. Stay tuned for holiday decorating and hopefully a DIY or two before the end of 2017!! Hello friends and happy Friday!! I seriously cannot believe it is already October and that this weekend is Thanksgiving!! Where does the time go ?! I feel a bit behind (and like I always say that) because of our unseasonably warm weather which has felt a lot more like July than October. The leaves are changing colour and the mornings and nights are cooler so it's slowly starting to feel more like Autumn. I finally got around to decorating for my favourite season and decided to keep things simple. I stuck with neutrals, some wicker and wood with a few pops of orange and mustard. I LOVE white baby boo pumpkins !! Closer to Halloween I start to incorporate more orange than neutrals. My mom is moving so I keep finding items in her garage that are up for grabs. I love this old cider jug that I styled on the mantle with some faux leaves from the dollar store and some thrift store books. I also got an apple basket from her that I put my porch mum in. I also love the Cinderella pumpkins on the porch!! The muted tones are perfect. It feels like I have been at Michaels every other day for their 60% off fall décor sales. I scored this leaf garland for $5 and I have been gathering fall florals for our wedding next October. I also got this new floral centerpiece in the galvanized bucket from Homesense which I plan to use for the wedding as well as seasonal décor. I planned on making a few DIY fall signs but can't believe how fast time has flown by since the end of summer. My focus has shifted a bit to wedding planning and getting things booked which has been so exciting and I can't wait to share some of it with you!! Thanksgiving is one of my favourite holidays and I am so looking forward to the long weekend spent with friends, family, too much wine and turkey! Check out my Pinterest for some fall and thanksgiving décor and recipe inspiration. I am planning to make this pumpkin cheeseball, caramel apple dip and turnip casserole. Wishing you and yours a Happy Thanksgiving !! Hello friends and happy FALL !! Today's post is not about my favourite season although I do hope to post one soon! Today I'm talking about the rustic picture ledges I made for our living room. By the end of summer I start to get bored with my interior decor so I always look forward to the change in season to change up my decor and colours. I have been staring at this wall and wasn't loving the simplicity of just having a print hung here so I decided to add picture ledges. I considered a gallery wall but these picture ledges provide more flexibility with changing frames and the arrangement without having to put additional holes in the wall. And the best part about them? I made them for FREE!! We recently replaced our roof and had a bunch of leftover 1x3s used for strapping. Although I could have purchased new wood for about $7 which is very affordable, my handy and frugal fiancée suggested using the existing wood. The plans I used from My Divine Home called for a 1x4x8, a 1x3x8 and a 1x2x8. I used a 1x3x8 instead of the 1x4x8 and had Tk trim a 1x3 down to 1x2. We also cut the length of each piece down to 42 inches. Once we were done cutting, I had (4) 1x3x42 Inches and (2) 1x2x42inches. Each shelf requires (2) of the 1x3s and (1) of the 1x2s. I used liquid nails and our brad nailer to assemble the shelves. I didn't take photos while I was assembling but you can find a more detailed tutorial here. Once my shelves were assembled I stained them using my favourite Minwax Dark Walnut. I knew I wanted a rustic, distressed look so I applied two coats of flat white paint on top of the stain. I then sanded the shelves heavily by hand using 100 grit sandpaper. I had TK help me hang them to ensure they were level and used 2 inch wood screws, drilling into the stud. 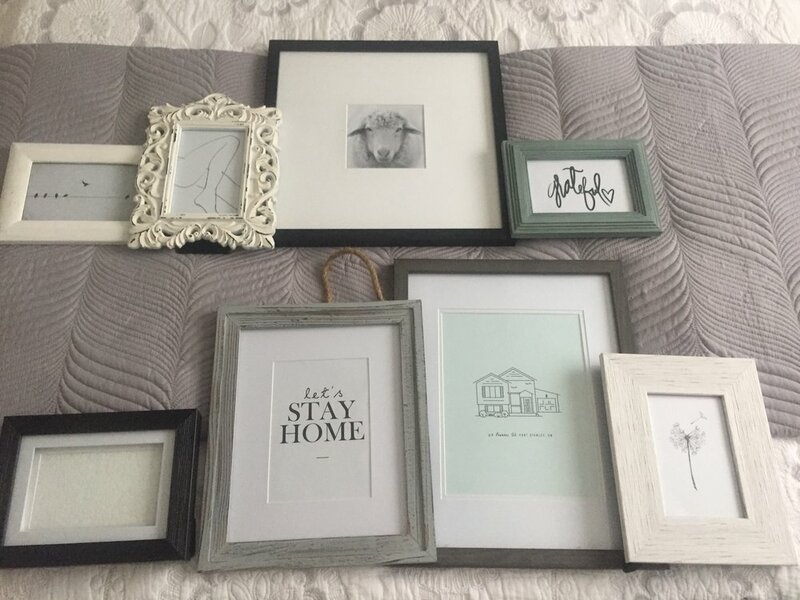 I have lots of frames kicking around but decided to grab a few new ones from Homesense using a gift card as well as the square black frame from Walmart. I framed some free printables as well as pictures and was ready to style the shelves. I am so happy with how these picture ledges turned out and love the interest that it brings to this wall. I am excited to change out the printables for holidays and seasons, frame engagement and wedding photos and eventually baby pictures :):):).